Do you think of the command line as an antiquated leftover from the past, or an old fashioned way of interacting with a computer? Think again. In Linux, it is the most flexible and powerful way to perform tasks. For example, searching for all .tmp files in a directory (and its sub-directories) and then deleting them can be a multi-step process when done via graphical user interface, but is a matter of few seconds when done through the command line. In this article, we’ll discuss the basics of the Linux command line including directory navigation, file/directory operations, and search. Once you have mastered these, you can check out Part II of this guide that goes a layer deeper to discuss file metadata, permissions, timestamps, and more. Note: This feature was originally published on 06/19/2014. We have bumped it because it’s as relevant today as it was before if you are learning the Linux ropes. Part of our #ThrowbackThursday initiative. 1. What is a home directory in Linux? Linux is a multi-user operating system, which means that more than one user can access the OS at the same time. To make things easy, each user is assigned a directory where they can store their personal files. This directory is known as a user’s home directory. Home directories are found under the home directory. For example, my home directory is /home/himanshu. Please note that a user’s home directory has the same name as their login name. If you are a Windows user, you can think of a Linux home directory as a user specific directory usually present inside C:\Documents and Settings or C:\Users. Users have complete control over their home directory as well as all its sub-directories. This means that they can freely perform operations like create and delete files/directories, install programs, and more, inside their home directory. 2. How to check the present working directory? Whenever you open a command line shell in Linux, you start at your home directory. This is your present working directory, which changes as you switch to some other directory. 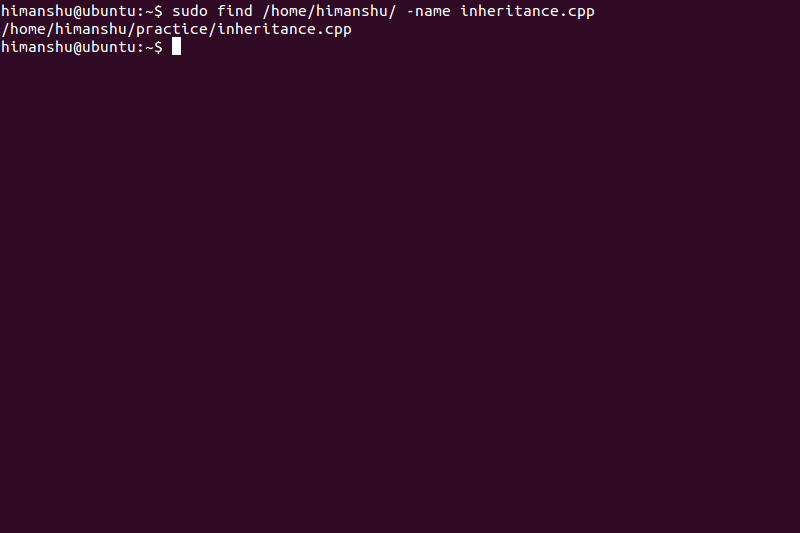 Use the pwd command to check the complete path of your present working directory at any point of time. The pwd command output, shown in the screenshot above, indicates that the user is currently in the Pictures directory, which is inside the himanshu directory, which in turn is a subdirectory of the home directory. 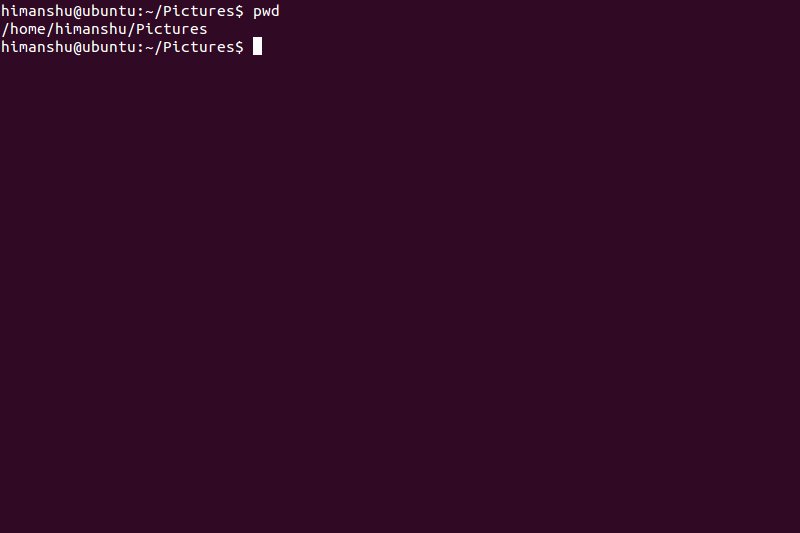 In this case himanshu@ubuntu:~/Pictures$ is the command line prompt. 3. How to switch directories? Use the cd command to navigate through the Linux filesystem. This command requires either a directory name or its complete path depending upon where the directory is present. For example, if your present working directory is /home/himanshu/pictures, and you want to switch to /home/himanshu/pictures/vacations, then you can simply run the command: cd vacations. In this case, the command line shell will search for the vacations directory inside pictures. A path relative to the present working directory is also known as relative path. 4. How to view directory contents? Use the ls command to list the contents of a directory. If the command is run without any argument, it displays the contents of the present working directory. To view the contents of any other directory, you can either specify its name (if it’s a subdirectory) or its complete path (if it’s not a subdirectory) as an argument to the ls command. If you observe closely, the output of the ls command is color coded. These different colors represent different types of files, making it easy to visually identify them. Some of the basic colors that you should know are: Blue (Directories), White (Text files), Red (Archives), Cyan (Links), Green (Executables), and Pink (Images). 5. How to view the contents of a file? Use the cat command to view the contents of a file. This command expects a filename as an argument. As you can see in the screenshot below, the cat command displayed the contents of the arg.c file. However, there is a limitation. If the file is large, the output might be too big for the command line shell screen to accommodate. In that case you can use use the less command along with the cat command: cat [filename] | less. The | symbol represents a pipe, which redirects the output of the cat command to the less command, which in turn makes it possible for you to navigate through the file’s content using the arrow keys on your keyboard to scroll up and down. To quit the display mode press the q key. 6. How to create a new file? Use the touch command to create a new file. The command requires a filename as argument. 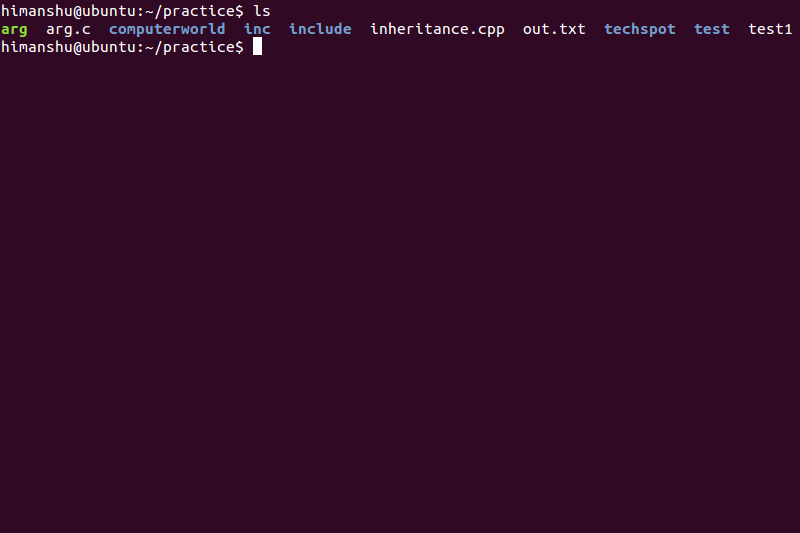 For example, to create a file named test.log in the present working directory, just run the command: touch test.log. To create a new file at a location other than the present working directory, use the absolute path. 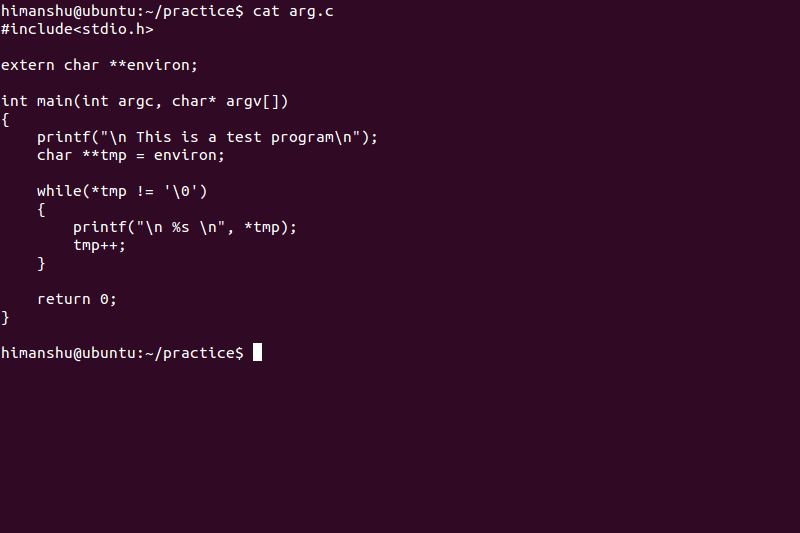 For example, touch /home/himanshu/practice/test.log. Tip: To write anything into a newly created file, use a command line editor like Vi or Vim. 7. How to rename/copy/delete a file? Use the mv command to rename a file. For example, to rename log.txt to new_log.txt, run the command: mv log.txt new_log.txt. As always, if the file is not present in the present working directory, use the absolute path. You can also use the mv command to move a file from one location to other. This is the equivalent of a cut-paste operation via GUI. 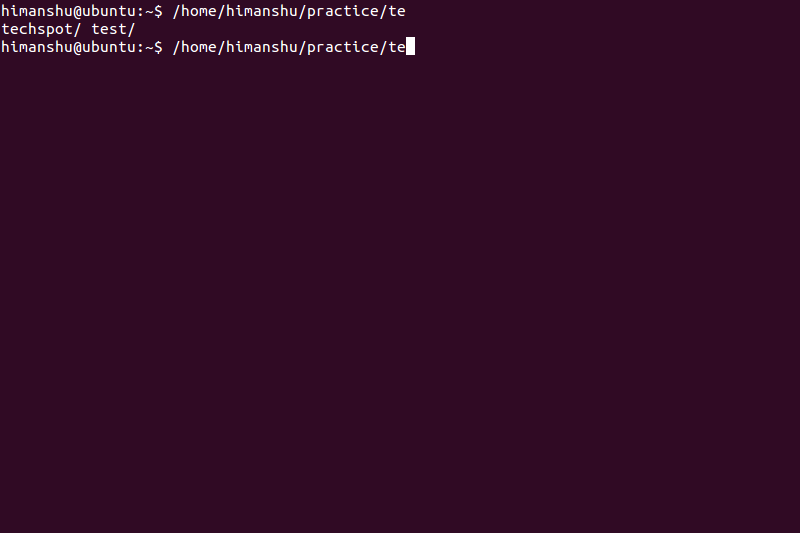 For example, to move log.txt (present in current directory) to /home/himanshu, run the command: mv log.txt /home/himanshu. To copy a file from one directory to another, use the cp command. Like the mv command, cp also requires a source and a destination. For example, cp log.txt /home/himanshu would create a copy of log.txt (with the same name) in the /home/himanshu directory. To remove a file, use the rm command. This command expects a filename as an argument. For example, rm log.txt will remove the text file, if present in the current directory, while rm /home/himanshu/practice/log.txt will remove the text file present inside the practice directory. 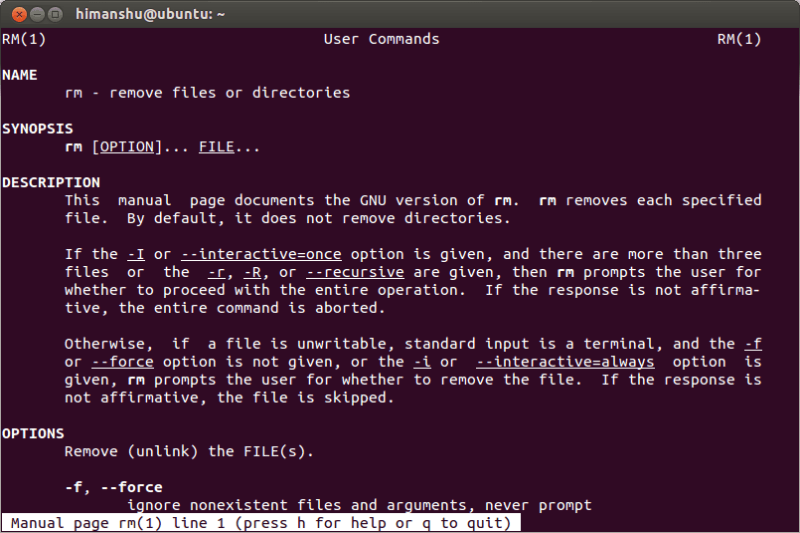 To remove directories, use the -r command line option with the rm command. 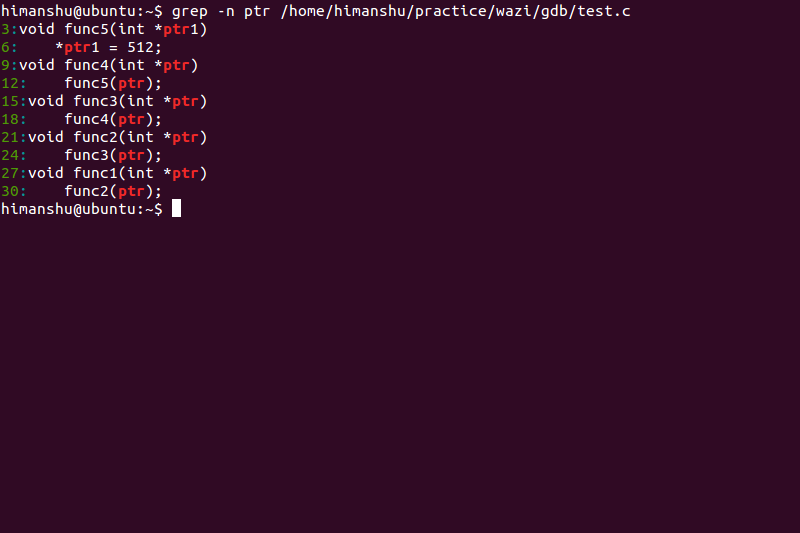 For example, rm -r /home/himanshu/practice/ would delete the practice directory with all its subdirectories and files. 8. How to search for files? I used sudo in the find command above to remove certain permission errors. You can skip it. If a directory path is not specified, the find command searches in the present working directory. You can also use wildcards with the find command to get the most out of it. 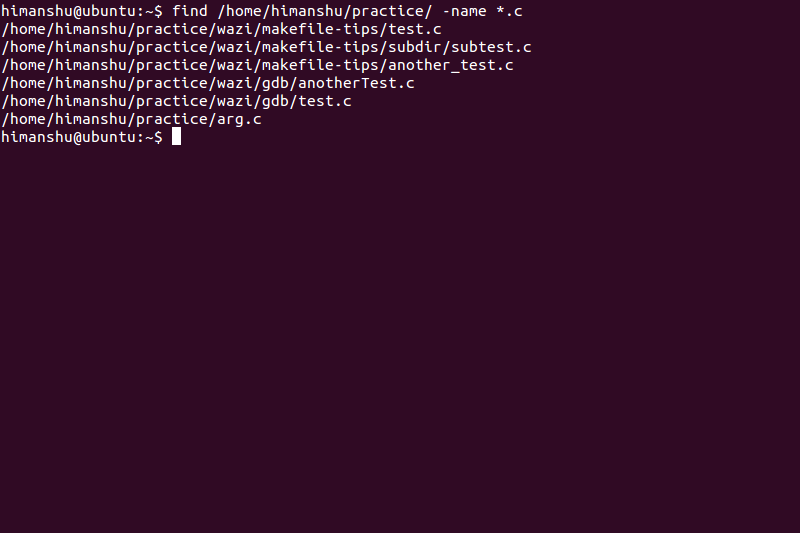 For example, if you want to search all .c files present in the /home/himanshu/practice directory, use the find command as shown below. The ‘*’ character is a wildcard that can represent any number of characters. For example, tech* can represent tech, techspot, techreport, and more. 9. How to search text within files? Use the -n command line option in case you want grep to display line numbers in output. Tip: To search a keyword in all the files present in the current directory, use the * wildcard character as the filename. Please note that unlike the find command, the grep command doesn’t search within subdirectories by default. However, you can enable this functionality by using the -R command line option while running the grep command. 10. What is the auto-complete feature? While working on the Linux command line, typing long paths, file names, and more can feel like a burden. Use the tab key to auto complete these long names and paths easily. For example, to write /home, you can just write /ho and press tab. The command line shell will auto complete the name for you. In the example above, it was easy for the shell to guess the name home because there was no other similar candidate in the / directory. But in case the shell encounters similar names while auto completing, it will display those names and you’ll have to write a few more letters for the shell to know the correct name. The shell displayed all the names that it can use for auto completion. If, for example, you wanted to write techspot, then you’ll have to type in at least c to resolve the ambiguity. Once done, you can hit the tab key again to autocomplete the name. Root is the only user that has control over the entire Linux system. It is capable of doing what normal users can’t, such as, changing ownership of files, adding or removing files from system directories, and more. As you can guess, the root account is mostly used by system administrators only. 12. What are man pages? To learn more about Linux commands, you can head over to their respective man (or Manual) pages that come preinstalled with Linux. To open a man page, just run the man command followed by the command name. For example, run man rm to open the manual page of the rm command. You can find a lot of useful information about Linux commands this way. We’ve barely scratched the surface here, as the Linux command line has much to offer. Practice and master each and every command discussed in this article.